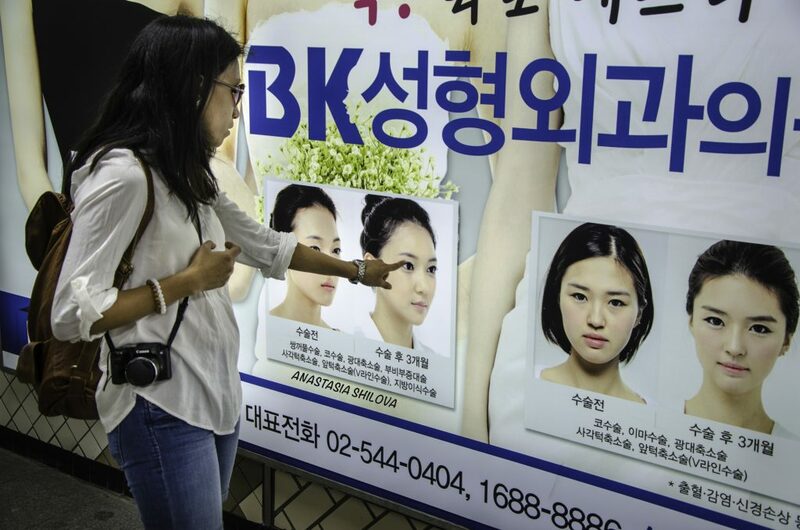 Everything we think we know about beauty, South Korea knows it better. But the reality of the worlds plastic surgery mecca may not be that beautiful. The Olympic Games in PyeongChang drew many tourists to beautiful South Korea to watch the performances during the games, but also to explore Korean culture in general. South Korea has a rich history and diverse cultural heritage that are worth exploring. However, it is one side of the Korean culture that has been the victim of several controversies; the constant chase after beauty. Who doesn’t want to be beautiful, you may ask. But what if I told you that one out of five women in Seoul have had plastic surgery done, and that a lot of girls get plastic surgery as some sort of reward from their parents for doing well at school? The fact that many women tend to get surgery done before applying for a job to help increase their chances to get it? Or as Patricia Marx, a journalist from The New Yorker puts it: “In South Korea, the phase “You would be a lot prettier if you just had your jaw tapered”, are considered no more insulting than saying “You’d get a lot more for your apartment if you redid the kitchen”. True to the country’s confucianist tradition, the South Korean society is also very conformist. You follow the trends and try not to stick out too much from the people around you. Naturally, this is also a tendency for the beauty standards that seems to embrace the Korean society. The Korean beauty standard goes something like this: small face, double eyelids, white skin, high bridged nose, clear skin, and a V-shaped jaw. We are not talking about beauty as in having thick and long lashes, but even the shape of your face literally becomes an object that can decide how beautiful you are. Few Koreans are born with these features naturally, most Koreans are born with one eyelid, they have flat noses, and round faces, which makes plastic surgery the only way to achieve the results they want according to the beauty standards. 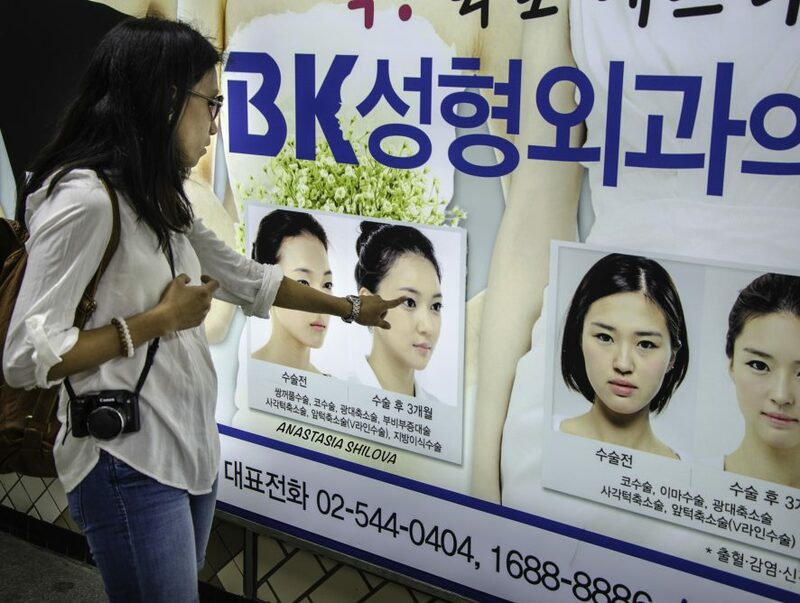 To get an insight in what Korean people themselves say about this, as well as their thoughts about the issue, a digital news channel named “Asian Boss” went out on the streets of Seoul and asked questions related to the issue of plastic surgery. All the women they asked had thought about getting plastic surgery and some told their reasons were because “everyone does it”, or their parents encouraged them to do it. The most standard surgery, according to the survey, is the double eyelid surgery. The double eyelid surgery, or blepharoplasty, is often not even referred to as a surgery, but rather a “procedure” that you just do. The goal with this kind of surgery is to make your eyes appear bigger, but some also argues that is has something to do with wanting to be more “white” or “western”. However, achieving western characteristics isn’t the reason for women undergoing these surgeries, Erin Luna Barseth argues. She lives in South Korea and works in a famous makeup store called “Etude House” is one out of many famous beauty and makeup brands in the country.“Their beauty standards goes far back in history and has been consistent for centuries”, she tells me. This perspective is also presentenced in an article by the Guardian about the double eyelid surgeries, which suggests that “[…] most people would consider a good surgical result to be one that replicates a “natural” East Asian double eyelid, while one that mimics European features is seen as “fake” (and cheap).” What we can see is while South Korean women definitely want to look as beautiful as possible, beauty must be on their own premises. When we speak of these women pursuing beauty on their own premises, we are finally giving them a voice and not viewing them as passive participants in the hands of the beauty industry. We often think about women undergoing surgeries as victims of the pressure that society has created; however, there might be more to it. To get an authentic insight in this topic I spoke with Kim So Yeon, a Korean exchange student here at University of Oslo. She told me about how there is currently a discussion going on in South Korea about whether one can say that undergoing surgeries it is entirely the women’s own choices, or if the pressure is so heavy that she is forced to undergo surgeries and accept it as her own choice. People have different opinions on this matter and it is hard to take a stand when we see how complex the issue is. So Yeon told me she believes there is some truth in the immense pressure from society plays a big role in many surgery cases. As Erin was telling me, Se Yeon also speaks about how Koreas beauty standards goes back in history and has little to do with race. What can we find in South Koreas history that can make us understand why the pressure on having perfect features are so great? One approach to this question can be to look at the country’s rise from poverty and the inferiority complex that many people believe still haunts them. South Korea used to be one of the poorest countries in the world, but like many East Asian countries, they were able to pull off their own “economic miracle” and become a wealthy nation. No country wants to return to the poor times in their history, but it seems like especially South Korea has this fear of even being associated with those times. Therefore, pursuing physical perfection is the outward manifestation of success. This phenomenon is not only seen in terms of plastic surgeries, but also the hyper- competitive nature of the Korean society in all aspects of life, for example school and work. In a society where everyone wants to get ahead and come off as successful, we see how easily the pressure to have a good outwards figure remain strong. If we compare the way we look at and approach beauty in Norway and South Korea, and not to mention the pressure regarding this, we can see a lot of differences. – As women, my friends and I were thaught to criticize ourselves at an early age. We never thought we looked pretty or fit enough, and constantly compared ourselves with others, Yeon says. This may sound terrible for a Norwegian reader, as we are often encouraged to do the opposite. We are bombarded with self-love campaigns and are thaught from an early age that we should not compare ourselves with others. We also have certain taboos when it comes to plastic surgery. It is not that accepted unless it is for health reasons, and even a “small” procedure such as the lip injection, which is common in Norway, is frowned upon by many public figures that are against the beauty pressure. This doesn’t mean that we don’t have any pressure at all, but we have more people speaking up against it, and it’s not the norm. This is also the impression So Yeon has of the Norwegian society, as she notices one detail that differs from what she is used to in her home country. – Norwegian women don’t wear makeup that much, and even if they do, it’s not an everyday occasion, as it often is in South Korea. I think it’s because they don’t feel the pressure to wear it all the time, she says. Despite South Koreas heavily beauty centered society, the country is slowly moving forward to a more diverse and accepting culture. So Yeon says that she hopes for a brighter future for the South Korean society when it comes to accepting different looks, and how they view women. – In South Korea it is very normal to criticize a woman based on her look, which leads many women to become insecure. Fortunately, as a society we are changing and gradually more people are speaking up against people who criticize women in that manner, Yeon explains. As for Erin, working in a makeup store has given her the impression that many women are starting to challenge stereotypes and are developing a more individual view of beauty rather than religiously follow the beauty standards.